Our B & B in Fowey was very quaint, apparently one of the oldest buildings in the town, dating from 1430, but our morning peace was somewhat disturbed by the seagulls who were up and about at 4am. We left Fowey about 9.45 – there didn’t seem much point in hurrying as it was raining. 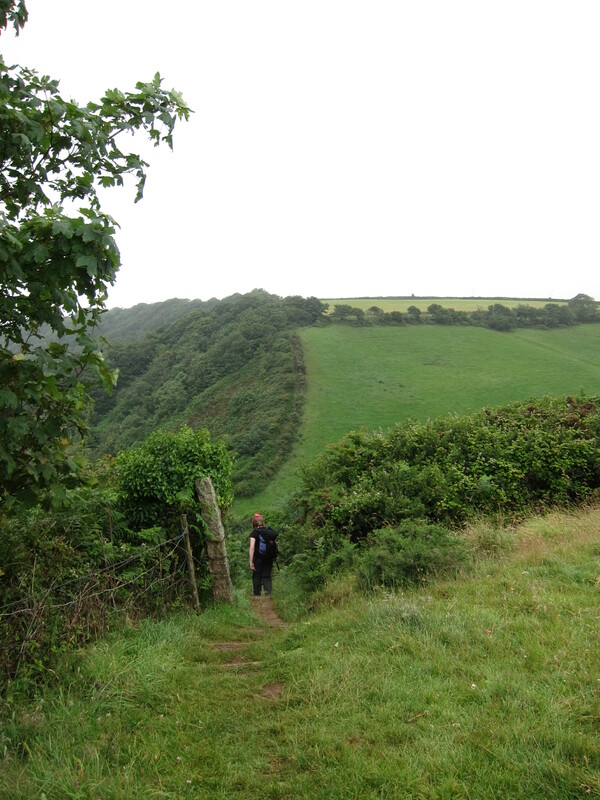 The path climbs out of the town, but here, as elsewhere it is very poorly signposted. We hummed and hawed at an unmarked fork. A young Swede or German rushed past, saying he was sure it was the right hand fork, so we followed him. After a quarter of a mile, he came rushing back – no, it was the other fork. For a couple of hours we could see him zooming over the headlands to the west. I presume he is at Land’s End by now! After walking for an hour or so we came to the most gorgeous house, hidden in a cove. It was absolutely the perfect house – it even had its own duck pond. At the next junction the map and the signage disagreed. We decided to follow the signs, thinking that the path may have been diverted since the map was printed. It ended, however, with us missing a walk up to the light-house that we could see coming out of Fowey, and hitting a road instead. However, as it was still raining, there would not have been much to see. 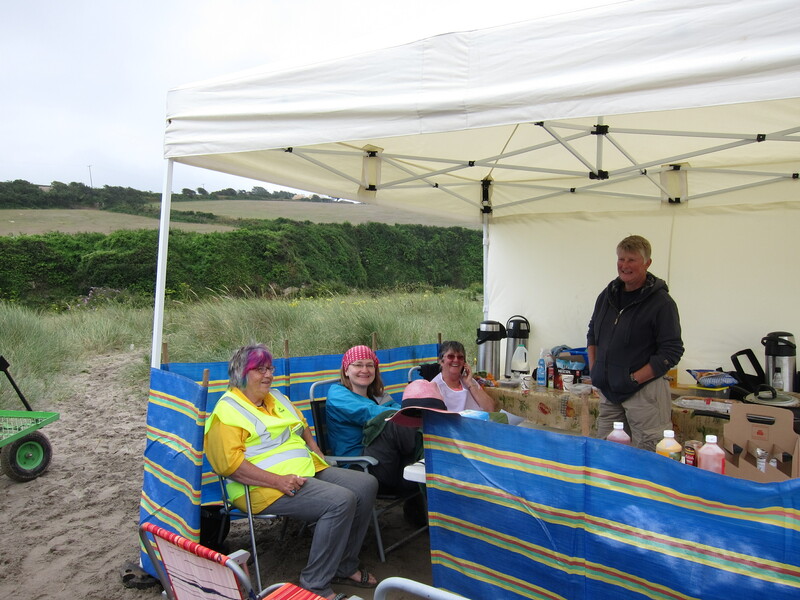 We came to another little cove, this one had a coffee stall, and a sailing school, so we sat in the rain and had a cuppa. The stall man was very helpful and explained that the map gave a false impression of the path at Par Sands. He gave us detailed instructions on how to negotiate the caravan park and the kaolin works. Whilst we were drinking our coffee, we watched a group of teenagers having a lesson in managing a dinghy. I began to feel faintly sea-sick watching them. We climbed another cliff, then dropped down into the dunes behind Par Sands. On the edge of the beach were two little gazebo things, housing the Par Sands Carnival Committee. They were hoping to raise money for the Carnival by selling hot-dogs etc at the planned raft race (which it appeared might be cancelled, or perhaps had already been cancelled, or might perhaps be back on if the wind changed. No-one seemed to mind.) They kindly let us leave our bags and boots under the shelter whilst we paddled. 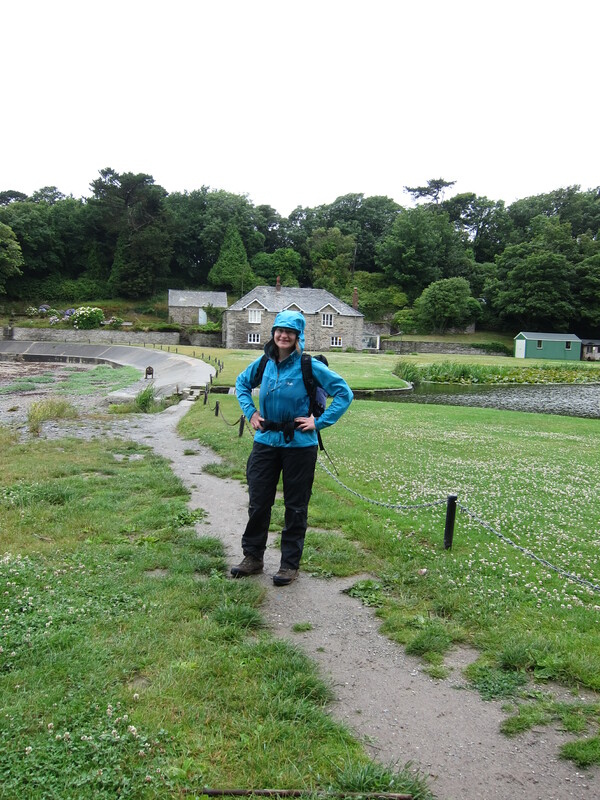 We must have looked a bit bizarre – paddling in our rain gear. We then consumed a couple of excellent fresh hot dogs. Along the grey sands of the beach, then through the caravan park, onto the road through the town, and round the Works. Our B & B called to say they wanted to go out. It was no problem to us as we were unlikely to arrive before about 7pm. 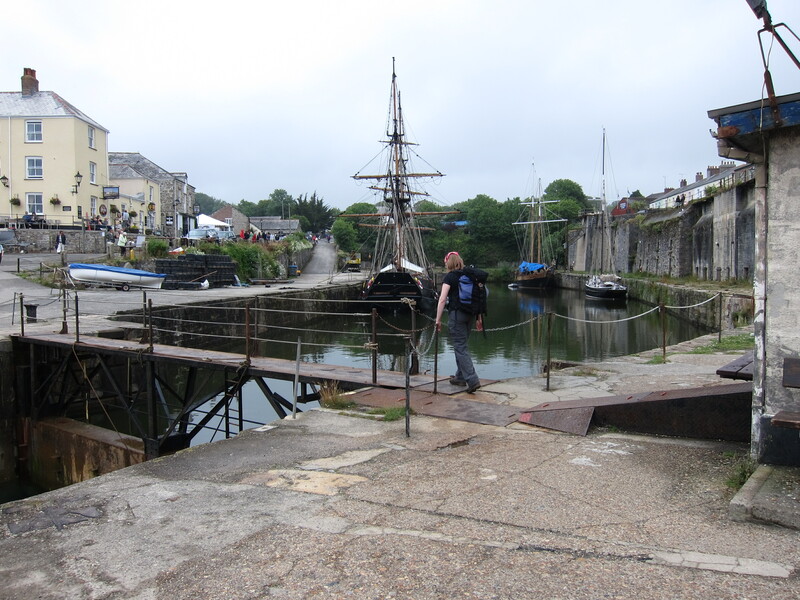 Around 3.45 we came to the port of Charlestown (Porth Meur). This was developed from the original hamlet of West Porthmear in the late 18th century by the local squire, Charles Rashleigh. The purpose was to transport the huge amounts of, first, copper, and then china clay coming out of the Cornish mines. The last exports left in 2000, as the port is not deep enough for modern shipping. Pleasing to our eyes, was the sight of the pub, and even more pleasing was the sign advertising Prosecco Cream Teas. We took advantage of this excellent combination of food and drink, not leaving until about 4.30. Unfortunately, that had a bit of a knock on effect and progress was slow. We got hopelessly lost at a place called Trenarren, although not so lost as another group of people who several times set out on different paths, only to re-emerge where they started, like actors in a farce. Eventually, we found the right route (no thanks to the sign-posting) and, after some punishing ups and downs between headlands, arrived at Pentewan, the town prior to Mevagissey. We stopped for ten minutes, which was a mistake, as Rachel’s foot began to play up as soon as she put her boots back on. The last mile and a half into Mevagissey along the tarmac was rather miserable. We have been cheered both by our supper, in the local Indian, and by our excellent B & B (see review). Although we’ve done under 14 miles, it has been a tough day. This entry was posted in Cornwall and tagged Charlestown, Cream tea. Bookmark the permalink. I do not even understand how I finished up here, however I assumed this publish used to be good. I do not understand who you’re however certainly you’re going to a famous blogger if you aren’t already.